Cilantro and lime are a perfect pairing as a marinade for grilled steak. Lime acts as a tenderizer, making a lean cut of beef soft and juicy. This recipe is quick to prepare and cook and only requires some patience as you let the meat marinate before cooking and rest once it's off the grill. In a blender or small food processor, combine cilantro, scallions, garlic, lime zest, lime juice, salt, and pepper. Process until completely pureed and no chunks remain. Place steak in a resealable bag or a medium baking dish and coat with half the marinade. Cover with saran wrap and place in the refrigerator to marinate for at least 30 minutes. Put remaining cilantro lime sauce in a bowl and reserve in the fridge. Spray grill grates with nonstick cooking spray or brush grates with oil. Heat grill to 500° F. While the grill is heating, remove steak from the refrigerator and let it come to room temperature. Remove steak from marinade, place steak on the grill, and cover to cook, flipping once, 6 to 8 minutes per side for medium rare. While the steak is grilling, heat reserved marinade in a small saucepan and keep warm for serving. Remove steak from the grill and let rest for 5 to 10 minutes before slicing against the grain. 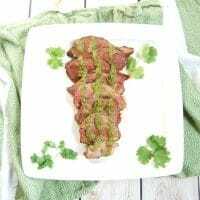 Serve sliced steak with warmed cilantro lime sauce drizzled on top. Prep and cook time are less than 30 minutes, but remember to reserve time for marinating the beef!